The Hatch SGK100 Street Guard Gloves feature 100% Kevlar inner lining on the inside of the fingers and palm for protection from sharp objects. The outer palm layer is of durable synthetic leather with Posi-Grip non-skid material in the cradle of the hand for maximum grip and weapon control. The back of the hand is constructed of 1.5mm neoprene and nylon spandex to provide a snug fit without hindering dexterity. Terry cloth on the outer thumb can be used to wipe away perspiration. 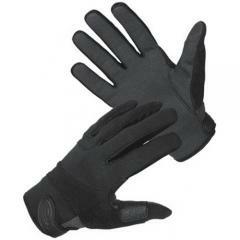 A VELCRO® closure keeps the Street Guard gloves secure on your hand making these Kevlar gloves an even better choice. Nice looking gloves but the stitching started coming out the first time I wore them. They are really nice gloves but I found that the size is more like men size I usually wear small but should have bought the x-small one. Think a size under for women. Great gloves but the material on the index finger often deteriorates prematurely.